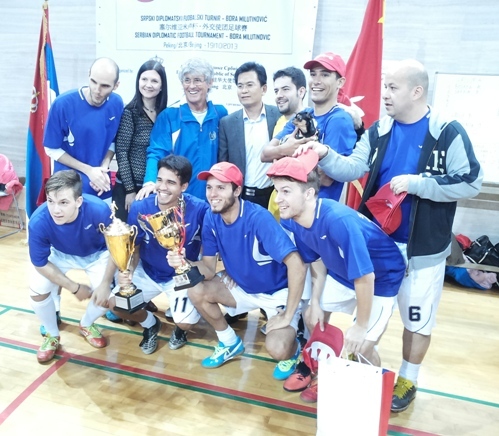 (Beijing, 21 October 2013) Diplomatic football tournament „Milu Cup 2013“, organized by the Embassy of Serbia, with the support of the Association „Serbia and Friends“, was held in Beijing, in the hall of the National Olympic Sports Center on 19 October 2013. „Milu Cup“ was held in the presence of the Chinese media, the diplomatic corps, Serbian diaspora and Chinese football fans. Organized in honor of the famous football coach Bora Milutinović, „Milu Cup“ has grown into a traditional event, which annually brings together an increasing number of participants. This year 17 teams attended the tournament, with players from many more countries. In addition to the Embassy of Serbia, in the tournament participated the embassies of Bulgaria, Poland, France, Russia, Bosnia and Herzegovina, Romania, Italy, Croatia and the combined team of South American countries „Suramerica“, as well as B. Milutinović’s team „Milu Stars Aspire“, teams of the Ministry of Foreign Affairs and the State Administration of Sports of China, and medias CCTV, CRI, Global Times and Sino-us.com. Exclusive sponsor of this year's „Milu Cup“ was the company „Shandong Hi-Speed Group“, while the media sponsors were China Radio International and Global Times. Winning team of the fifth „Milu Cup“ was „Suramerica“. Second place went to the team „Milu Stars Aspire“, third to Bosnia and Herzegovina, while Serbia was fifth. Juan Manuel from „Suramerica“ won the „Best player“ award. Charge d’ Affaires a.i. of the Embassy of Serbia, Mrs. Tatjana Panajotović Cvetkovic, Deputy General Manager of "Shandong Hi-Speed Group" Mr. Deng Wenhua, and Mr. Bora Milutinović presented the trophies to the winning teams.